These Saints came from Corinth, and lived during the reign of Emperor Decius (249-251). They were arrested because of their Christian confession and faith, and they were brought before Tertius the proconsul, who had authority over the Morea. After punishing them with various torments, each received a different martyric death. 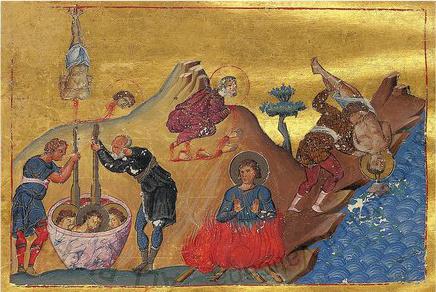 Saints Victorinus, Victor and Nikephoros, the three together, were placed inside a large mortar, and all the members of their body were broken, and they delivered their souls into the hands of God. Saint Claudius had his hands and feet cut off, and he came to an end. Saint Diodoros was put into a fiery furnace, and came to the end of his martyrdom. Saint Sarapinos was beheaded by the sword. And finally Saint Pappias was cast into the depths of the sea. All of them received crowns of martyrdom from the Lord. The sevenfold band of Martyrs shone forth as a seven-branched lamp, through the radiance of holy Faith. By their shining contests they illumine the way for those who faithfully cry: blessed Martyrs, pray to Christ our God, to grant us His great mercy. O blessed Martyrs, as Christ's courageous soldiers, you scattered the enemy principalities. Rejoicing in one spirit, you proclaimed together: Christ is the crown of Athletes. Claudius and Victor the revered, together with Victorinus and Pappias the sacred, with Diodoros, divine Nikephoros and also Sarapinos let us all bless.